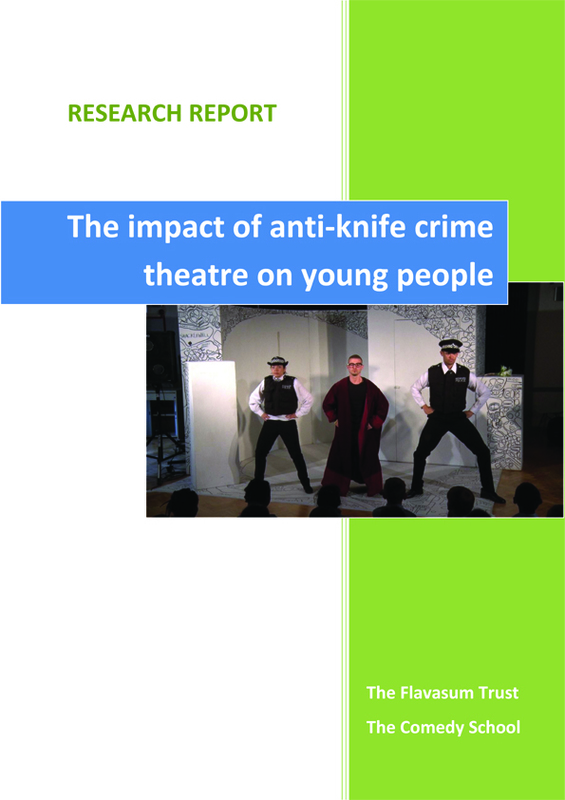 The aim of this project was to evaluate the impact of a single performance of an anti-knife comedy play on young people. Can watching a single performance of forum theatre change attitudes and, if they do, are they temporary changes or do they last for a longer period of time? The Flavasum Trust, The Comedy School and the Metropolitan Police together agreed the questions to be answered anonymously by Year 6 pupils (aged 11 years) in the London Borough of Barnet before and after a performance of The Comedy School’s play ‘It’s No Joke!’ during June 2012. A third questionnaire was completed a year later by Year 7 pupils who had, and had not, seen the play at Barnet’s secondary schools. In 2014, six Focus Groups of 65 Year 8 pupils were held in two of the schools. A total of 1847 questionnaires were completed before the play, 1180 after the play, and 1243 a year later. Those questionnaires that were completed by the same pupils before and after the play totalled 910, and those that could be matched before, after and a year later totalled 285. There were 450 completed questionnaires by pupils at secondary schools who had seen the play, and 535 by those who had not seen it. The results were transferred into spreadsheets and the answers analysed. Those responses before and after the play were subjected to t-tests and Chi-squared tests to assess the statistical significance of the results. After seeing the play, those who chose to do something if they met someone carrying a knife increased from 87.5% to 97.1%, a statistically significant increase. Those who would do nothing dropped from 13% to 3% after the play and to 1% a year later (3 pupils). Twice as many boys as girls have thought about carrying a knife. After seeing the play, although the numbers dropped, a few who had previously said they would never do it changed their mind during their first year at secondary school and would then consider it. The number of pupils who thought carrying a knife was a defence dropped by 88% after seeing the play. Of those who still thought it was a defence, boys dominated girls (77% to 23%). Before the play, 87% thought they knew the consequences of carrying a knife. Afterwards, 93% considered they had learned more, but of those who had not, boys dominated girls (60% to 40%). A year later, of the 62% who correctly knew the consequences if they were arrested for carrying a knife, 10% had stated they had not known before they saw the play. Those at secondary school who had not seen the play were more inclined to respond negatively or provide incorrect answers than those who had seen the play. The majority of pupils in the Focus Groups thought the use of comedy was more effective than serious drama, a talk or a video. On the basis of these results, we strongly believe that a single performance of an anti-knife crime comedy play is highly effective for this age group. However, the positive outcomes can only be sustained if the performance is part of an ongoing structured programme of interventions to reinforce the message that carrying a knife is not a defence. The Executive Summary (4 pages) and full report (68 pages) can be downloaded below.